My grandfather raised chickens in his back yard. Growing up in New Jersey, our homes were adjacent and we shared a common driveway. I got to know Pop's laying hens by name and could often recognize their eggs by their size, color and shape and in which nest box they were deposited. His chickens caused me great emotional trauma on two occasions-- once when I killed one accidentally and then when I unknowingly ate "Biddy," one of my favorites (See: Chicken Killer). By giving the chickens names I got to know their individual traits and personalities. They were like little people to me, like Bambi whose mother was so cruelly killed in a movie that traumatized many little kids. I hated the "Chicken Hawks" that sometimes took the pullets. Yet I eat my Big Mac without thought of abattoirs or anonymous bovines. We have watched a Bald Eagle nest over seven breeding seasons. The eagle watchers gave some of them names. 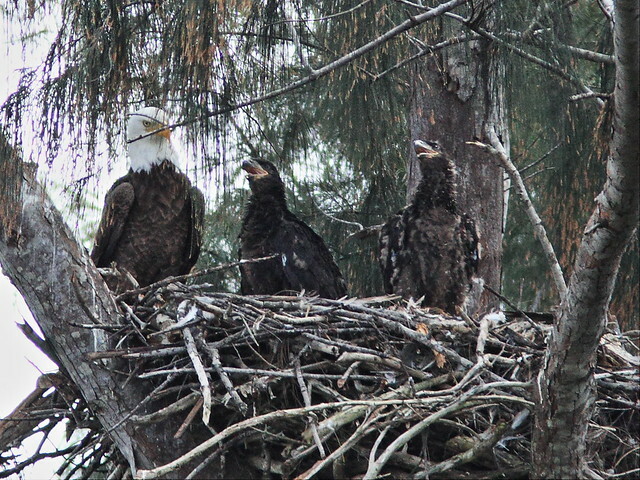 This year, Pride and Joy's 12th and 13th eaglets are named Honor and Glory (See them in my Bald Eagle FORUM). Naming them gives people a connection with these majestic birds and has often opened doors to a much greater appreciation of the natural world. Is it a good idea to name these wild creatures? School children conducted polls back in 2009 and 2010 to name the broods: twins Hope and Justice, and triplets Lucky, Chance and Courage. When eaglets fledge they sometimes disappear for a few days before hunger drives them back to the nest. Since there is a high risk of mortality at the time of first flight, their absence causes great anxiety. "Hope is lost!" "Waiting for Courage!" These two returned, but two other fledglings (the 9th and 11th) disappeared and ground searches found no sign of them, dead or alive. They were mourned as departed friends (Pride and Joy's Family Album). 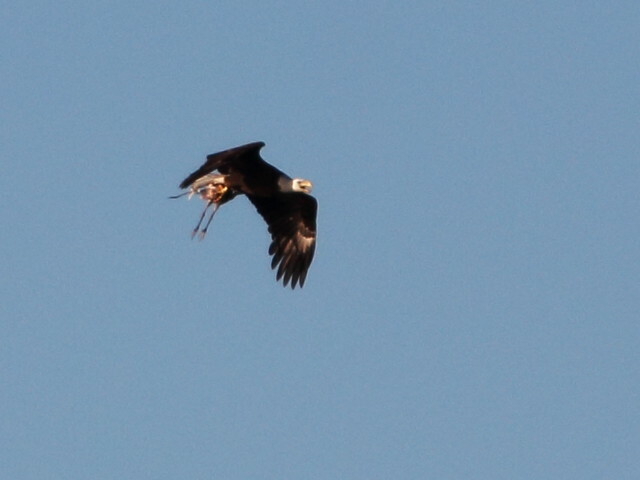 I took this photo of the male eagle (Pride) from about 1/2 mile away as he carried a Tricolored Heron to his two growing eaglets. Did I mourn the loss of this beautiful long-legged wader, a species that often graces the shores of the lake in our back yard? Truthfully, I was indifferent as it had no name. 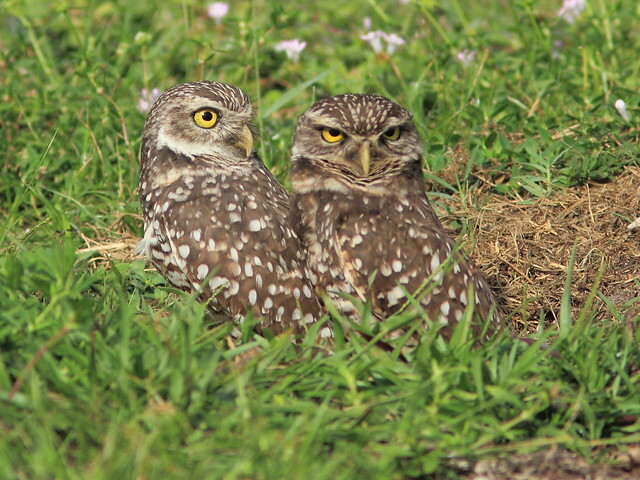 Burrowing Owls nest on 65 school properties in the Broward County School District. They have bred at one of the locations for at least 30 years. A nest camera has monitored their daily activities at one school for the past year. The owls were given names by the students and they avidly followed happenings at the nest. Last November I was asked to photograph the pair to provide images for fund-raising T-shirts and trinkets. The pair was very obliging, but rarely did both stare at the camera at the same time. Their faces are distinctive-- the male is on the right. Most of the time they were always looking in different directions, ever alert because predators higher up on the food chain have learned to look there for an easy meal. Over the eons the fittest survive and the weak and unwary are weeded out. 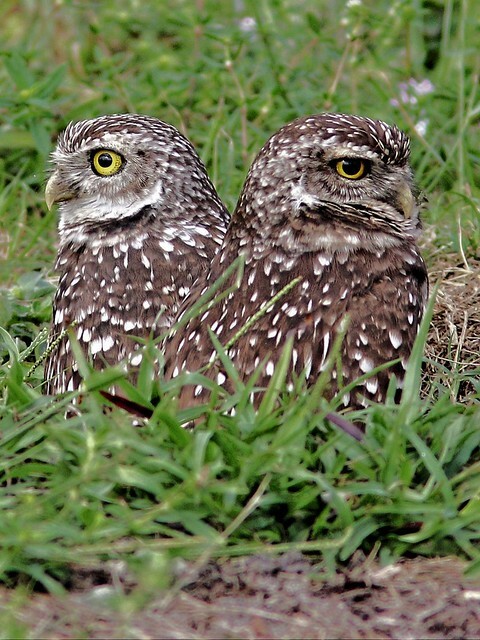 They face the threat of bird hawks by day, and larger owls by night. 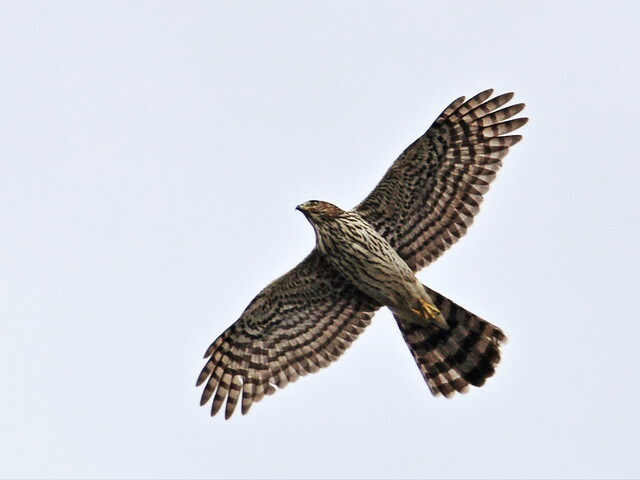 While I was photographing the adults a Cooper's Hawk flew towards them. They immediately saw it coming and dove down into the burrow well before it swooped low over the nest. In early January, an immature Cooper's Hawk visited the burrow three times during this 5 minute clip, even reaching down into the cavity in search of the owls. By January there was evidence that the owls had offspring. 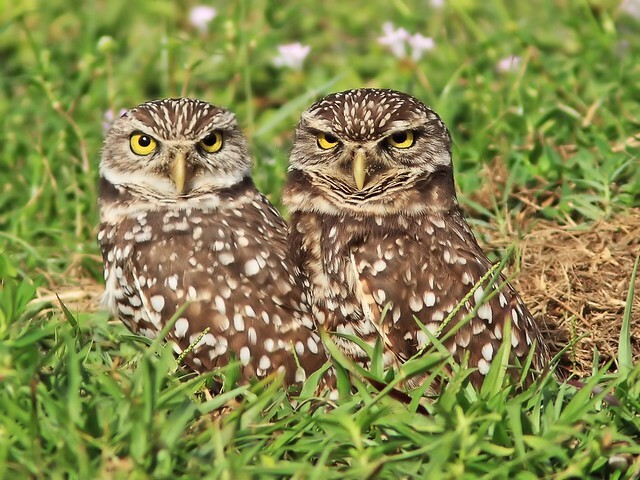 Heavy rains threatened to flood their burrow, but during February four owlets appeared. They were given names. The first to emerge was an adventurous little owlet named "Peeper." Perhaps he was too adventuresome. Here, the little tyke ventures too far from the nest. Upon seeing a threat, that thankfully never materialized, it dives back into the burrow even before all three of its siblings can get out of the way. You may skip the next clip if you are disturbed by the raw violence of nature. Why didn't at least one of the dozing babies keep an eye on the sky at all times? The adult Cooper's Hawk is exercising its survival skills just as two of the owlets fail in theirs. There is cunning but no hate. Almost by accident, the hawk grasps two owlets at once, kills both but can carry off only one. Usually these encounters occur out of sight and mind, but the camera captures all. And the owlets had names. One of my male students responded after watching the graphic loss of the owlets, "that is so sad". He was obviously in deep thought for a while and then suddenly said, "I know what I will do. I will bring in my favorite piece from my rock collection, obsidian. Will you place it at the burrow as a memorial for the two owlets?" I said yes and he did bring it in. We will let him place it by the perch. This shows some of my students have become attached to the owls and their owlets and will be more likely to show understanding and compassion toward other species as well as an appreciation for nature. Wasn't this one of our owlcam goals from the beginning? The cooper's feathers sure show up nice on your photo in flight. And the owlets are great whether they are looking at the camera or not. Great post!